Although I did not attend this concert, i wanted to give it a quick review from the information I have gathered on it. 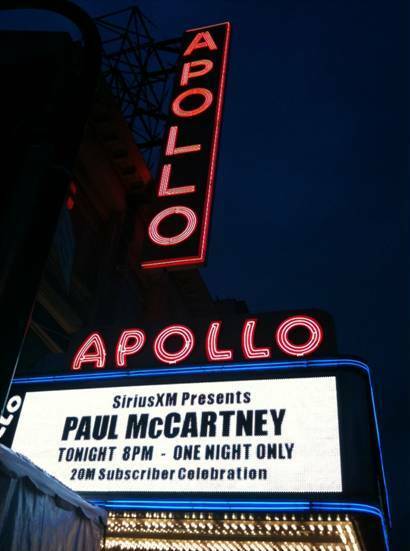 Paul played a special once in a lifetime event at the Apollo Theater this past Monday night. It was a Sirius satellite radio event held for a private audience & some very lucky listeners. 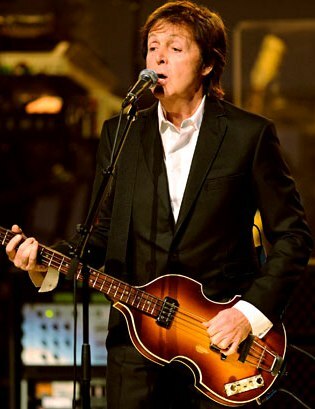 Celebrities lined the rows of seats, as everyone from Keith Richards, Ron Wood & Little Steven to Howard Stern, Tony Bennett, Jimmy Fallon, Ben Stiller, Alec Baldwin, Matt Damon, Rob Thomas, Patti Smyth, Duran Duran, Kevin Bacon, Jerry Seinfeld, John McEnroe & famous John Lennon photographer Bob Gruen were on hand. Hitch Hike (Marvin Gaye tune) The sound system went out on this one but all was repaired. Performed with mini skirt go go girls as well!! Wonderful Christmastime (with the Academy of Harlem Choir) awesome!! As the lights went on Christmas colored confetti snowed down in the theater. 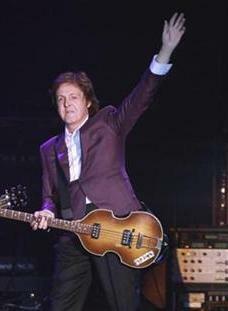 Don't Forget: Sirius Channel 33 is doing a limited time all McCartney Channel through the New Year. It's really good, hearing alot of old Wings B sides & rarities!!! thanks to all contributors, reviewers & youtube people. Great post. I have been listening to Paul on Sirius. I just wish they had more material. He has so much stuff, but this seems to be a 4 hour loop.